“They say if you try making anime for 3 days, you’ll never be able to quit and that in 3 days you’ll also be broke. But even if I were to go broke, I still don’t think I’d be able to quit.” These words from Tezuka, upon receiving an award late in life, express his passion for his work in anime, but he had an equal passion for manga. But doing experimental anime proved so expensive, that he had to produce over three hundred volumes of manga in his lifetime to support his ongoing anime work. The more anime work he did, the more money he needed. The more money he needed, the more manga he produced. He was such a workaholic that he rarely left his office, where he often slept and usually ate his meals. Towards the end of his life, he even had multiple desks set up in his office with different ongoing projects on each desk: He would move from desk to desk throughout the day keeping multiple projects going simultaneously, often sleeping as little as three hours a night. He lived 60 years, and in this time period, his complete works became the largest publication of a single author’s output of all time. No single author that I know of has matched his output in either prose or manga. It would be nearly impossible for anyone ever to surpass the amount of his artistic output—and I have not even mentioned the fact that his work was of the highest artistic quality produced in a wide array of genres targeted at every imaginable demographic. Upon finishing this near 900-page biography of Osauma Tezuka, the reader comes away with this sense of an artist who could not stop working. That and his high standards and idealism impress the reader of The Osamu Tezuka Story: A Life in Manga and Anime by Toshio Ban and Tezuka Productions (and marvelously translated into English by Frederik L. Schodt, one of the men most responsible for manga’s and anime’s surge in popularity in the United Stated). This grand biography manages to give an impressively detailed overview of Tezuka’s life with dates carefully recorded, showing the amount of research that went into this volume. Toshio Ban is to be commended for a work this all-encompassing because to give a biography of Osamu Tezuka is to give the history of manga and anime in Japan. Tezuka is Walt Disney, Stan Lee, Will Eisner, and Alan Moore rolled into one plus more. He artistically had impact greater than even what they accomplished all together. Like Walt Disney, Tezuka created loveable characters and cutting-edge animated films and T.V. shows that were for all-ages. Like Stan Lee, he created a universe of characters for all ages, many of them aimed at young men. Like Will Eisner, he paved the way for what sequential art could do and be, and like Eisner, he wrote intelligently about the art form. Like Alan Moore, but unlike Stan Lee and Walt Disney, Tezuka was far more mature, experimental, intellectual, and philosophical in many of his works, much of them coming from later in his life. When Tezuka is referred to as the “God of Manga” in Japan, they are calling him the God of animation and sequential art worldwide. And it is a fact that there is no other single creator of sequential art and animation worldwide who has had a bigger impact than he has. When people talk about the influence of anime on art and culture in the United States, they are talking about Tezuka’s influence. And that’s just a small example of his impact, years after he died. I hope I have emphasized enough how important to the world Tezuka is as an artist, and therefore, how much a biography worthy of him is needed. The Osamu Tezuka Story is that biography, and most appropriately, it is told in manga format by a man who worked with Tezuka for many years. Therefore, the style is very much in the Tezuka tradition. Toshio Ban has captured visually the fast-paced life of an artist, an artist who was followed around by editors waiting for their pages. In his younger years, Tezuka would hide out in different hotels trying to get work done without interruption from the many editors waiting for work from him, but he took on so many assignments, he could barely keep up with his deadlines. This biography captures the frantic life of a young artist who matured without giving up on his commitments right up until the end of his life, when he left multiple works incomplete, most sadly his life-long work The Phoenix, though multiple stand-alone volumes of this series were completed. The biography also tells the story of a man who was dedicated to education. Tezuka went to school for a long time, and eventually he even became certified as a doctor. This medical training would serve him well in the detailed operations he depicted in his medical thriller Black Jack, an extremely popular series featuring an unlicensed doctor who treats seemingly untreatable patients (in many ways a forerunner of the popular series House in the United States). Black Jack remains one of his most famous characters. One of the most unique aspects of Tezuka’s work is explained clearly in this biography: His stable of “actors.” Instead of creating a universe of characters, like we have in the Marvel Universe or the DC Universe, Tezuka created a universe of actors who would play different parts in all his series. So, Black Jack, in fact, may show up in another book as a different “character.” He would simply look like Black Jack. Toshio Ban illustrates this feature of Tezuka’s lifelong work in two ways. First, he draws the stable of actors for us on the pages of the manga. Secondly, he uses some of those actors throughout the biography by having them show up from time to time to talk to us as readers about certain aspects of Tezuka’s life. It is quite clever. Ban displays well the creativity he learned working with Tezuka for so many years. I am overwhelmed by this biography, by this work of art. It was created with such passion to honor Tezuka, and I believe Tezuka would have been more than pleased with this testament to his life. Ban does not hide Tezuka’s blemishes; for example, he shows clearly that Tezuka rarely spent time with his family, a fact that Tezuka himself was plenty aware of (I found online an early short manga he drew criticizing himself as an absent parent). So, we do not get an over-idealized version of Tezuka. But, still, the reader cannot but be moved by this portrait of Tezuka and weep with his many fans when the book closes with his death and celebration of his life. Anybody interested in manga, anime, Tezuka, or even Japanese culture should read this book — it is that good and that important for those of us with these interests. The Osamu Tezuka Story by Toshio Ban is the biographical manga Tezuka deserves. I hope my review persuades others not only to read it, but also to start reading Tezuka’s manga (start with Black Jack or Apollo’s Song or Phoenix: Resurrection — all available finally on Kindle) and start watching his anime. Not Astro Boy for kids, but the more experimental award-winning anime, the short “Jumping,” for example (you can find it on Youtube). This manga took me a long time to read because, even though I have read more than eighty volumes by Tezuka, I still stopped to read manga new to me every chance I got as I read through the biography. I also stopped to look up online the experimental anime mentioned throughout the book. I encourage readers of this biography to do the same. Take the time to stop and explore the works of Tezuka while reading about him. This biography is a great guide to his art. I must add that it comes with an excellent introduction by Frederik L. Schodt and, much to my surprise, the book is well-bound. At over 900-pages, this is a thick work of art that could easily fall apart with a typical binding. But the publisher clearly valued this biography enough to have it printed on quality paper and bound so that, unlike so many comics and manga, it will not fall apart any time soon. All-in-all this is a five-star production in writing, in art, in content, in translation, and in printing and binding. I cannot praise it enough or recommend it more highly. 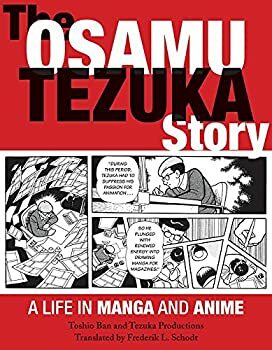 I hope I have made you curious enough to order a copy: To read The Osamu Tezuka Story is to be entertained with not only a biography, but also the history of manga and anime that was shaped by a single great artist. BRAD HAWLEY, who's been with us since April 2012, earned his PhD in English from the University of Oregon with areas of specialty in the ethics of literature and rhetoric. Since 1993, he has taught courses on The Beat Generation, 20th-Century Poetry, 20th-Century British Novel, Introduction to Literature, Shakespeare, and Public Speaking, as well as various survey courses in British, American, and World Literature. He currently teaches Crime Fiction, Comics, and academic writing at Oxford College of Emory University where his wife, Dr. Adriane Ivey, also teaches English. They live with their two young children outside of Atlanta, Georgia. Read Brad's series on HOW TO READ COMICS.